يقع Holiday Inn Old Sydney في حي الصخور التاريخي ويتميز بمسبح على السطح يوفر إطلالات على دار الأوبرا في سيدني وجسر مرفأ سيدني، ويضم غرفًا تحتوي على حوض استحمام في الحمام الداخلي. تحتوي جميع الغرف على تلفزيون بشاشة مسطحة مع قنوات فضائية وثلاجة ومكتب عمل، وتوفر جميعها مرافق صنع الشاي والقهوة واختيارك من وسائد ناعمة أو صلبة. يقع Holiday Inn Old Sydney على بعد 3 دقائق سيراً على الأقدام من الرصيف الدائري ومتحف الفن المعاصر، كما تقع الحدائق النباتية الملكية وجسر مرفأ سيدني ودار الأوبرا في سيدني على بعد 15 دقيقة سيراً على الأقدام. يمكن للضيوف الاسترخاء في مسبح السبا أو الاستمتاع بالشمس على تراس السطح، كما يقع مكتب الاستقبال الذي يعمل على مدار في الأتريوم الرائع المكون من 8 طوابق مع سقف زجاجي. توفر صالة وبار Lobby وجبات على طراز المقهى ومجموعة واسعة من البيرة والخمور الأسترالية، ويتم تقديم بوفيه إفطار يومياً في مطعم وتراس Playfair . يرجى الملاحظة أنه يتم خصم رسوم بنسبة 1.5٪ عند الدفع بأي بطاقة ائتمان وبنسبة 3.5٪ عند الدفع ببطاقة ائتمان أمريكان إكسبريس. سيطلب من الضيوف عند تسجيل الوصول إظهار بطاقة هوية تحتوي على صورة شخصية وبطاقة ائتمان. يرجى ملاحظة أن جميع الطلبات الخاصة ستكون رهنًا بالتوافر وقد تستلزم تكاليف إضافية. Location, location, location. In the heart of The Rocks area and close to dozens of restaurants and pubs as well as museums and historic sites. Didn't try a meal but the rooms are nice and everything is at your door. Within 5-7 Mins walk of the a major Train Stop, Circular Quay, so getting around the city and back was very convenient. A great cafe/breakfast place with 10 steps, The Fresh Food Store. And the rooftop view of the Sydney Opera House and Harbor Bridge was a great bonus - nighttime views were amazing! Would stay again. 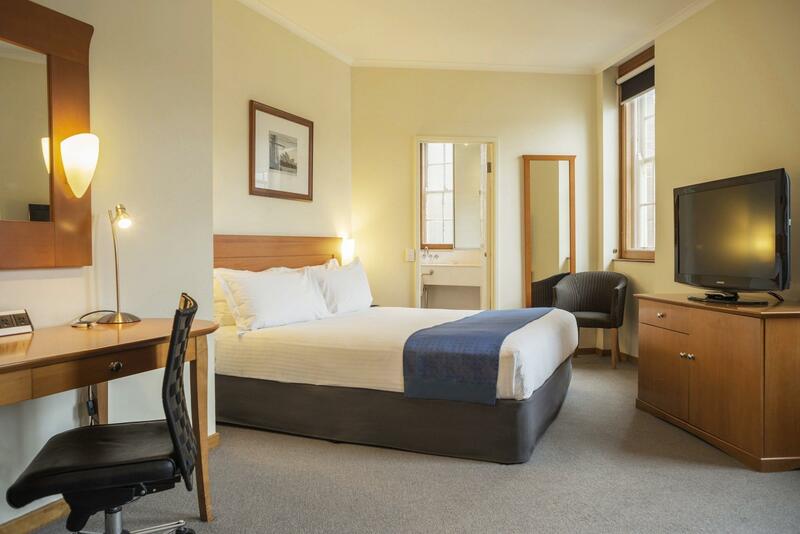 I had to spend a night in central Sydney and this hotel was perfect for that - easy to find by traffic or public transport in terms of location. 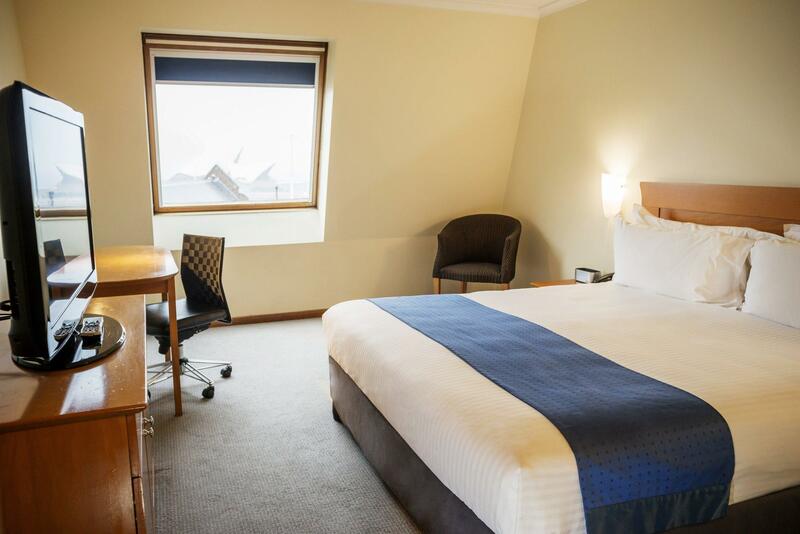 Room was standard - comfortable with all the basic items provided typical of a good centrally-located hotel in a global city like Sydney. Location, location, location! Such a fabulous spot of Sydney to stay in. Close to everything, food and drinks right at the doorstep. Hotel has a great view from the roof. The only con was probably the bathroom! It was tiny, really high step to get in the shower and there was mould on the tiles. The staffs are really helpful it makes you smile and happy just to make your stay memorable not only just to served you but as well as reaching your needs to find out if your really ok and happy especially asking; how’s your day, did you enjoy? Words that are friendly and spirited that are truly heart seeking experienced drives your mood positive and relax being a satisfied guest. It’s really a wow attitude in the hospitality service and that’s makes you a pampered paying guest with honor and pride. I was not happy with the room it was so load from out side that i could not sleep. The veiw from the window at night was of a street light witch was compounded by the fact that the windows were dirty. The bed was also a double and we have a king at home so that was not amazing. But not all was bad the roof top and pool have fantastic views and the food from the hotel is out standing. It is also situated in an amazing location for public transport. I love this hotel as it is in such a great position although I think the room is a little expensive. due to the traffic it was quite noisy. Great location if you are going on a cruise. Rooms were of a decent size with very comfortable beds. Staff were very helpful and friendly. Excellent location - within walking distance of all modes of transport (ferry, train, bus) and a great place to explore the history of Sydney. Staff were exceptional. The entire staff could not do enough for us from the bar to front desk. When we checked in we asked if we could check in extra luggage for family not staying. The staff put the extra luggage into storage until next morning without any questions. Great location for cruise ship embarkation at Circular Quay. Enjoyed the overnight stay. Thanks again staff. staff were friendly & helpful. location was awesome! Unfortunately the pool spa & sauna were out of action. The room would be better with fresh air or at least fan to circulate air as the windows can't be opened. We had a pleasant stay here and the location was just nice to reach everywhere. The environment was quiet and the view from our room was excellent. Looking forward to stay there if we had a chance to be back in Aussie. Appreciate the receptionist on arrival and departure they very helpful But disappointed with the housekeeping dept. Stay for 3days (16-19 Apr 2017) On 2nd day we went out of room at 9:00am and put ON the make up my room TAG when we came back at 2:00pm the room still haven't been cleaned then we went out again at 4:00pm and came back 9:00pm and the room still at that dirty conditions. I called up the front desk to inform and he said will one staff to fix it but i need to follow twice and waited for an hour before guy came. On third day got even worse when we came back at 10:00pm from a long trip and the room still haven't been cleaned. I still recommend the hotel based on its location but must improve the housekeeping dept. 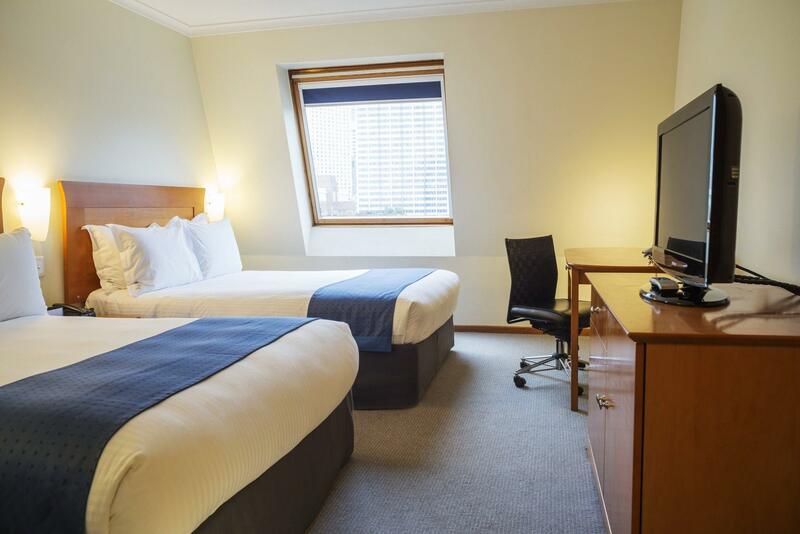 For a slightly more expensive room than the standard rooms they have, we have the view of the Sydney Harbour which is so beautiful particularly at night. 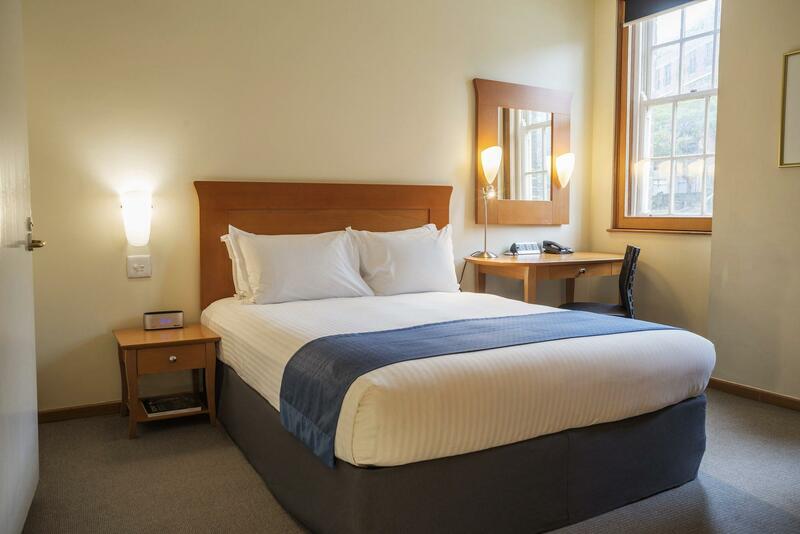 This is just a few minutes walk to Circular Quay and made our ferry rides to Manly Beach so convenient as well as all the touring around that we did around The Rocks, Sydney Opera House and CBD. We stayed there with our 6 and 8 year olds and we all had a really good time. Beds were very comfortable and the breakfast was lovely. Staff were really nice and room service meals were good too. They do not charge you the exorbitant $6-9 to bring your meals to your room like several other hotels do. The hotel is bit dated but very clean and rooms are tidy. 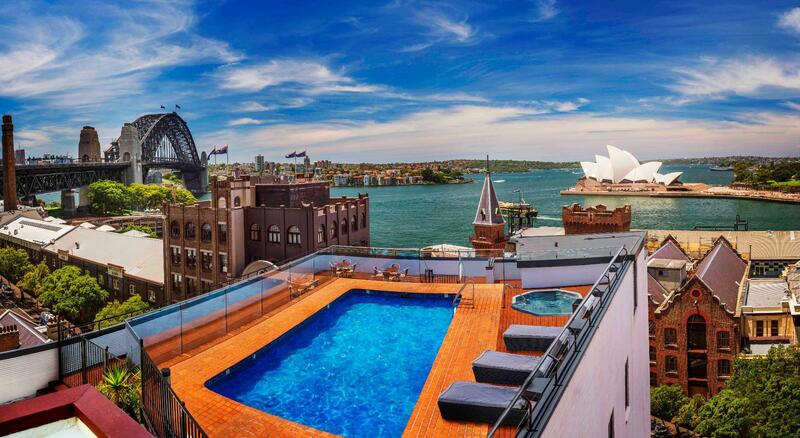 Roof top pool is excellent. The staff, the location, the convenience. No Hotel has a better location or friendlier and helpful staff.It offers comfort, decent room size , and is extremely clean. With so many options within a few paces, didn't try the dining room, but breakfast looked pretty good. A couple of observations. The internal colour scheme is dreadful, drab and just plain wrong. Poo brown and dirty yellow might be the (almost) colours of the era when the building was constructed, but they make the giant foyer area look turgid and dated. Surely a designer could add some neutral pale taupes and antique whites to give a more contemporary appearance?? The Air conditioning is mysterious, though effective and a tad noisy. No doubt the next upgrade will address this. Therse criticism are cosmetic and do not detract from the main thing, location, value and comfort.